In programming, we often want to take something and extend it. For instance, we have a user object with its properties and methods, and want to make admin and guest as slightly modified variants of it. We’d like to reuse what we have in user, not copy/reimplement its methods, just build a new object on top of it. Prototypal inheritance is a language feature that helps in that. The property [[Prototype]] is internal and hidden, but there are many ways to set it. Please note that __proto__ is not the same as [[Prototype]]. That’s a getter/setter for it. It exists for historical reasons, in modern language it is replaced with functions Object.getPrototypeOf/Object.setPrototypeOf that also get/set the prototype. We’ll study the reasons for that and these functions later. By the specification, __proto__ must only be supported by browsers, but in fact all environments including server-side support it. For now, as __proto__ notation is a little bit more intuitively obvious, we’ll use it in the examples. 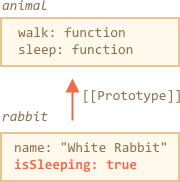 Here the line (*) sets animal to be a prototype of rabbit. Here we can say that "animal is the prototype of rabbit" or "rabbit prototypically inherits from animal". So if animal has a lot of useful properties and methods, then they become automatically available in rabbit. Such properties are called “inherited”. The value of __proto__ can be either an object or null, other types (like primitives) are ignored. Also it may be obvious, but still: there can be only one [[Prototype]]. An object may not inherit from two others. The prototype is only used for reading properties. Write/delete operations work directly with the object. That’s for data properties only, not for accessors. 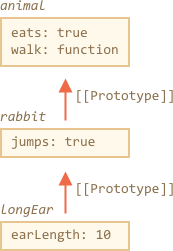 If a property is a getter/setter, then it behaves like a function: getters/setters are looked up in the prototype. Here in the line (*) the property admin.fullName has a getter in the prototype user, so it is called. And in the line (**) the property has a setter in the prototype, so it is called. An interesting question may arise in the example above: what’s the value of this inside set fullName(value)? Where the properties this.name and this.surname are written: into user or admin? The answer is simple: this is not affected by prototypes at all. No matter where the method is found: in an object or its prototype. In a method call, this is always the object before the dot. So, the setter call admin.fullName= uses admin as this, not user. That is actually a super-important thing, because we may have a big object with many methods and inherit from it. Then inherited objects can run its methods, and they will modify the state of these objects, not the big one. For instance, here animal represents a “method storage”, and rabbit makes use of it. If we had other objects like bird, snake etc inheriting from animal, they would also gain access to methods of animal. But this in each method would be the corresponding object, evaluated at the call-time (before dot), not animal. So when we write data into this, it is stored into these objects. As a result, methods are shared, but the object state is not. We can use obj.__proto__ to access it (a historical getter/setter, there are other ways, to be covered soon). The object referenced by [[Prototype]] is called a “prototype”. If we call obj.method(), and the method is taken from the prototype, this still references obj. So methods always work with the current object even if they are inherited. We have rabbit inheriting from animal. 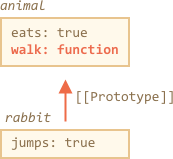 If we call rabbit.eat(), which object receives the full property: animal or rabbit? That’s because this is an object before the dot, so rabbit.eat() modifies rabbit.